Formula 303 is an all-natural muscle relaxant. This unique concoction is all-natural and non-habit forming; a great alternative to other synthetic based muscle relaxants or prescription sedatives which can sometimes include negative side effects. We include Formula 303, prepared by Dee Cee Labs, in our supplement care package for all of our initial DRS Protocol patients. This is a powerful formula that really works. Formula 303 currently is one of the best-selling natural muscle relaxant and tension relievers made right here in the USA. Formula 303 is an all-natural homeopathic remedy composed of only two herbal ingredients and magnesium. 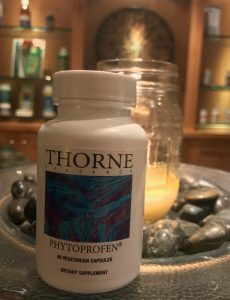 This particular combination has proven effective for over 50 years to help relax muscles and ease symptoms of insomnia, tension, anxiety & stress, muscle spasms aches, and pain. Formula 303 includes of 6 parts Valerian Root, 3 parts Passiflora, and 1 part Magnesium Carbonate. Valerian has an interesting history in healing with therapeutic uses dating back to antiquities and the time of Hippocrates who was known to prescribe it as a medicinal herb. By the 16th Century, Valerian Root was popularized as a natural remedy for insomnia, headaches, nervousness, and jitters. Even at that time it was considered so effective it was known casually as an “All-Heal” supplement. Again, in the modern world notably during World War II it was used to treat stress and anxiety naturally among soldiers and military personnel. Valerian Root is a perennial plant originating in Europe and Asia and has since acclimated to regions of North America. Valerian contains antispasmodic qualities that are effective in treating muscle pain, and calming side effects that are useful when taken for depression and anxiety, along with carminative abilities to help regulate digestions and relieve stomach pains. Valerian Root is not recommended for women who are pregnant, nursing, or for young children. If you are expecting or nursing, please consult your family physician before adding Formula 303 or Valerian Root to your supplement regiment. Passiflora or Passion Flower, is a perennial climbing vine that produces beautiful flowers and fleshy fruit. Passion Flower can be found in Europe, as well as growing naturally in southeastern regions of the US. Passion Flower is commonly used in teas or extracts for infusions and tinctures. Passion Flower is actually an all-natural tranquilizer and has presented itself as a safe alternative to many medicinal treatments for anxiety, which can have harmful side effects and are often addicting. Passiflora has been shown to be useful in reducing tension, nervousness & anxiety, and restlessness, symptoms of menopause, ADHD and even conditions such as seizures, high blood pressure and asthma. Passiflora also contains natural aphrodisiac properties. Magnesium is a key nutrient that can help to reduce restlessness and excitement, insomnia, and muscle cramps. Magnesium acts in the body as an electrolyte, assisting in neural activity and proper brain function. The magnesium in Formula 303 acts as a neural stabilizer and a nice compliment to the Valerian Root and Passiflora, offering a very therapeutic and soothing effect. On going studies have continued to show the innumerable benefits of herbal remedy blends such as Formula 303. We utilize Formula 303 to help promote proper nerve functioning and stabilization, along with easing sore muscles and tissues during initial care treatments for the DRS Protocol, a non-invasive spinal decompression therapy we offer here at Auth Chiropractic & Vitality in Dillon, Colorado. 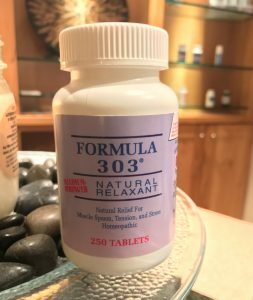 We have Formula 303 available for purchase for all of our guests and patients, along with an array of other top shelf supplements and wellness items. If you’d like to learn more about Formula 303 and why we incorporate this unique supplement in our DRS Protocol care package, reach out anytime. We are happy to answer questions and look forward to helping on your journey to wellness and vitality.